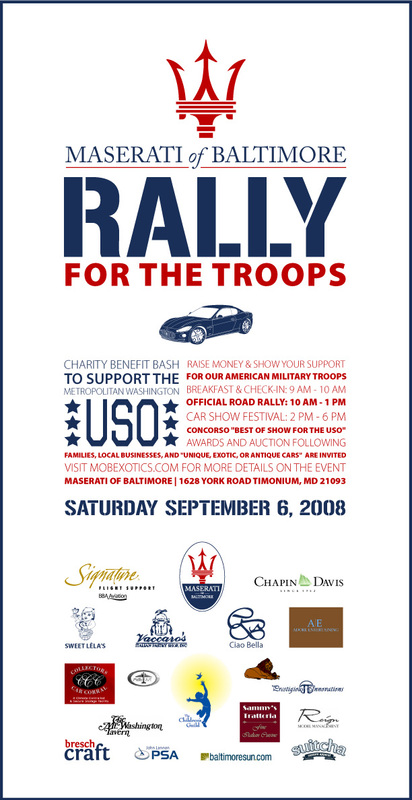 Maserati Fans, listen up… Support our troops by sporting a very fashion friendly USO METRO Rally t-shirt. Due to an overwhelming show of support for our United States military troops and the USO Metro mission–and a request for memorabilia that will allow dealership friends to display their patriotic loyalty–we’ve joined forced with Terrence Breschi from Suitcha and Breschcraft and are getting ready to print our first run of the Maserati of Baltimore SUPPORT THE TROOPS: BUY A SOUVENIR T-SHIRT car lover collectors limited edition souvenirs. With the Maserati trident emblem proudly displayed and smart looking red and navy blue print, our desert sand color shirts make a smart statement with jeans or khacki slacks for men or women any day. Sizes will be available by custom order, and outfitting the family is encouraged. We’ve chosen an easy fit and easy wash cotton for the first run of shirts, but the art work is ready to be screen printed onto any personal item or other fabric selection you might choose. BUY A SHIRT, THE M.O.B. TEAM WILL DONATE TO THE USO METRO. Prices for our own pre-ordered shirts are $15–and for every one purchased, we’ll be donating a healthy percentage back to the USO Metro directly. If you are interested in ordering other festival souvenir gift items like canvas bags, tote bags, hats, sweatshirts, hoodies, jackets, umbrellas, posters, mugs, scarves, or shawls, contact us at mobexotics@gmail.com. Childrens, Ladies, and Mens sizes are available, including Extra Large size options (XL, XXL, XXL). Even better, this shirt design is non-dated, so you can wear it year ’round for many seasons to come. 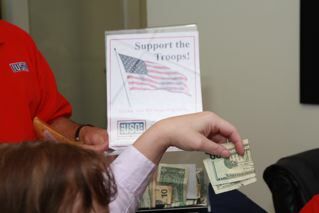 To make a cash donation directly to the USO of Metropolitan Washington, a non-profit organization, please visit http://www.usometro.org. ORDER IN PERSON OR ORDER BY EMAIL ONLINE. OUR CAR DEALERSHIP PARTS DEPARTMENT AND RACE FAN BOUTIQUE ARE READY TO SHIP NATIONALLY AND INTERNATIONALLY–HELP US SUPPORT THE TROOPS. Please feel free to call our visit our M.O.B. 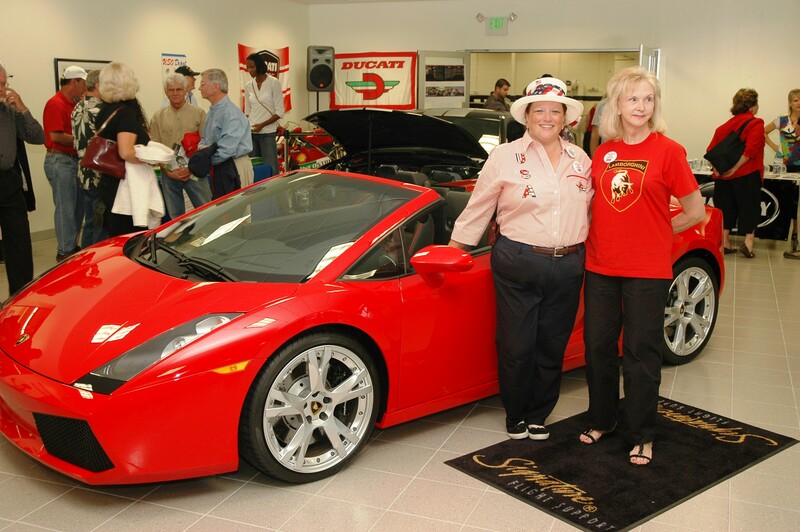 Exotic Car Gallery and Race Fan Boutique and ask our Parts Manager Vincent Veiga or General Manager Jack Davis about placing your order for the shirt. We accept Visa or Mastercard, Cash, and Personal Check orders. In addition, we can arrange to ship gift items nationally or internationally. If you are purchasing for a club, large family, as give aways, or for a corporate group, discounts are available for ten items or more. Further requests for information about multi-media “Support Our Troops & the USO” items should be directed to Terrence Breschi. He can also answer questions about costs for doing screen printing, embroidery, airbrush art, or silk screening for our Rally art or any of your other corporate professional business marketing or car show commemorative collector items. For the middle of a quasi-hurricane tropical storm, we have an amazingly full house. Between staff, volunteers, and visitors nearly 200 people were already on site well before noon plus a whole other wave of family and friends are expected to be arriving to keep busy for the rainy Saturday afternoon. We’re writing the outline of this post for early readers on the fly in the middle of the party to let all of our incoming visitors know what’s going on indoors, and we’re going to pop back to smooth out the wording and typset once the day is through. The party we’re having to raise some money for the USO is a obviously a hit, and hitting back harder than even the weather can keep down. After beginning on a two hour delayed start this morning, we welcomed our waterlogged rally guests and volunteers in form all corners of the mid-Atlantic region. Please forgive our typos–we’ll be back to edit and share more on Sunday Afternoon. Kae Davis and Jeanette Scott reporting live from Maserati of Baltimore during the heart of the storm. INCOMING VOLUNTEER, STAFF, AND RALLY BRUNCH. 10:00 BREAKFAST FOR VOLUNTEERS AND STAFF STARTS. THE TABLES ARE SETTING UP, DISPLAY AREAS ARRANGED. THE FRONT SHOWROOM AND MIDDLE GALLERY ARE READY TO SHOW. ENJOYING BREAKFAST TREATS PROVIDED BY OUR STAR CHEF TONY GAMBINO AND ASSISTANT GARY (HIS HEAD CHEF FOR THE CIAO BELLA RESTAURANT), GUESTS LINGERED AND MURMERED DELIGHTFUL “MMMMS” ABOUT THE WARM FRITATAS AND WELCOMED ITALIAN MORNING FOOD. 11:00 AM. DISAPOINTED RALLY PARTICIPANTS WHO WALKED IN WITH GLUM FACES DUE THE THE RAINY WEATHER AND HIGH WIND SAFETY CANCELLATIONS IMMEDIATELY PERKED UP TO THE SMELL OF FOOD AND THE SIGHTS INSIDE OUR SHOWROOM. WITH SIGNATURE’S VIP LOUNGE OPEN FOR ALL TO RELAX AND AN INCREDIBLE DISPLAY OF FURNITURE COMPLIMENTS OF MIKE RUDDEN OF MOTORART, IT TOOK THEM A MINUTE TO NOTICE THE COOL MASERATI SHOWROOM DISPLAY OF RED, WHITE, AND BLUE DECOR–INCLUDING OUR SPECTACULAR DISPLAY OF COLOR COORDINATED EXOTIC CARS. THE THEME FOR THE DAY IS IMPROVISE — AND GOD WILLING WE’LL MAKE IT THROUGH. OUR FRIENDS FROM SIGNATURE FLIGHT SUPPORT ARE ON THE BALL. WITH OUR TABLES AND SHOWROOM SEATING AND HOSPITALITY WORKERS FROM ADORE ENTERTAINING CANCELING FOR THE WEATHER CONDITIONS, THEY ARE HOPPING TRYING TO RECONFIGURE OUR VIP LOUNGE TO KEEP OUR INDOOR SEATING GOING. WE’VE BEEN PARKING MOST PEOPLE DIRECTLY ON SITE, BUT NOW THAT OUR LOT HAS FILLED UP WE ARE TAKING RESERVATIONS FOR SHUTTLE PICK UP “AT YOUR CAR” IN THE NEIGHBORHOOD RITE AID (UNDER COVER) OR KOHLS PARKING LOT ON RIDGELY ROAD IN LUTHERVILLE TOWARDS THE LIGHTRAIL STREETSIDE AREA. 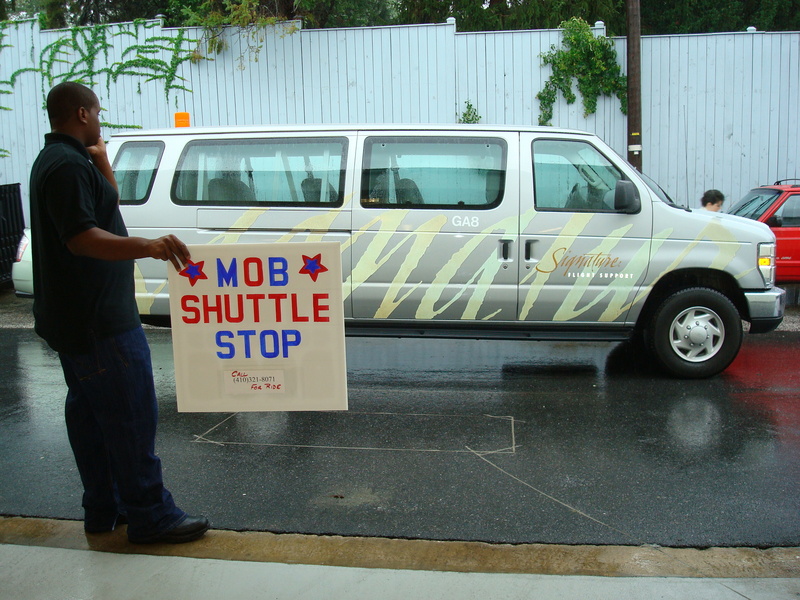 WHEN YOU ARRIVE, PLEASE CALL US AT THE STORE FOR SHUTTLE SERVICE PICKUP. WHEN YOU SEE OUR SIGNATURE VAN PULL SLOWLY THROUGH, FROM THE CAR PUT ON YOUR HAZARD LIGHT SO HE CAN RECOGNIZE YOU. IF YOU ARE STANDING UNDER THE OVERPASS, JUST WAVE. NOW THAT WE’VE HAD OUR BREAKFAST AND BRUNCH PASS, WE’RE NOTICING PEOPLE WHO WERE PLANNING ON STAYING ONLY FOR SHORT MORNING SHIFTS ARE DECIDING TO STAY ON “A LITTLE BIT LONGER” TO SEE WHAT WE ARE DOING FOR THE AFTERNOON. HIGH NOON SHOWDOWN IN THE M.O.B. 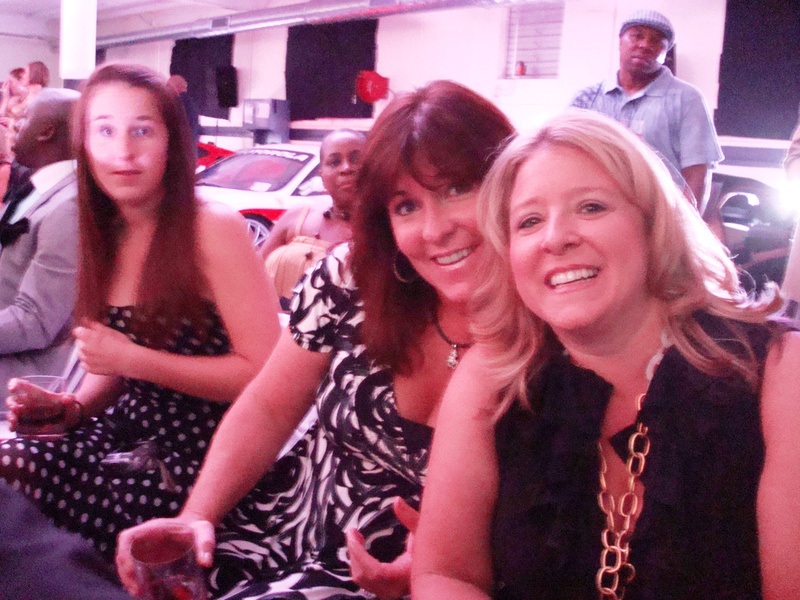 EXOTICS GALLERY AND RACE FAN BOUTIQUE. ROLLING INTO THE NEXT HOURS, GUEST AND VOLUNTEERS AND OUR ARRIVING SOLDIERS ENJOYED PASTRY FLOWN IN FRESH FROM NEW YORK COURTESY OF SWEET LELAS MARKET CAFE. OWNER TONY IACAMPO SAID, “YOU KNOW WHAT? THE PARTY IS SO GREAT AND THE CROWD IS SO GOOD, WE’RE NOT EVEN GOING TO VEND FOOD THIS AFTERNOON. THE FOOD TODAY IS ALL ON US; OUR COMPLIMENTS TO THE USO.” HE’S ON SITE AS WE TYPE MAKING FRESH ITALIAN COLD CUT SANDWICHES, AND HAS EXTRA PLATES OF LASAGNA PAIRED WITH SIDE SALADS ON THEIR WAY TO KEEP GUESTS HAPPY AND BUSY EATING WHILE THEY RIDE OUT THE STORM THIS AFTERNOON. 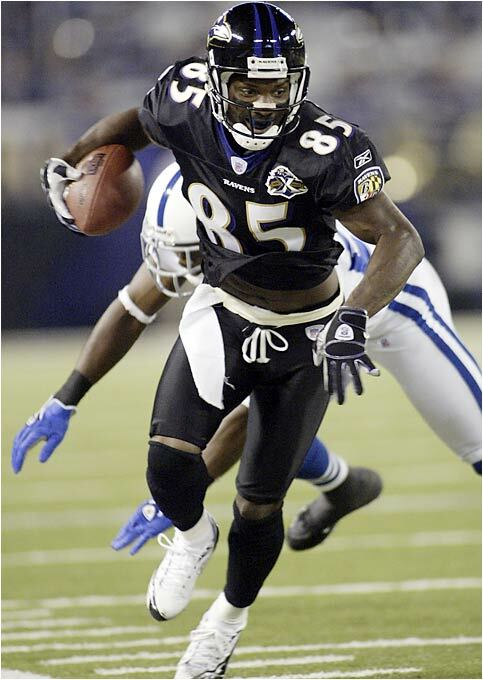 HE’S ALSO STEPPING UP T0 HELP COVER OUR VIP FOOD NEEDS BY BRINGING THE CROWD DECADENT ITALIAN PASTRY BITES THIS AFTERNOON TO SWEETEN THE MASERATI OF BALTIMORE RALLY FOR THE TROOPS RAIN OR SHINE DEAL. COME AND SEE THE SIGHTS. SPECTATORS WELCOME. NOT ONLY DO WE HAVE A HOUSE FULL OF EXOTIC CARS, WE HAVE THE MOST LOVELY LADIES GREETING GUESTS AT OUR DOORS, COMPLIMENTS OF VICTOR ROSSI DESIGNS. OWNER MANNISH HAS DONATED “12 INTERNS TO HELP US HOST OR HANDLE ADMINISTRATIVE SUPPORT”. WITHOUT ADORE, THEY ARE ALL JUMPING IN TO HELP KEEP OUR DEALERSHIP AREAS BUSSED AND IN ORDER LIKE THE MOST EFFICIENT OF FRIENDLY RESTAURANT WAITRESSES. UNDER COVER, THE MOOD IS COOL AND THE COMPANY WARM. ROLLING OUT OF THE SHOWROOMS AND INTO THE BACK RACE SHOP AREAS, MOUNT WASHINGTON TAVERN IS HERE SERVING DOGFISH BEER ON TAP. THE KEGS ARE FLOWING TO A SATISFIED GROUP OUTSIDE IN THE RACE SHOP WHO ARE BUSY CHECKING OUT NOT ONLY THE EXOTIC AND SPECIAL CLASSIC CARS BUT A COOL DUCATI DISPLAY FROM SPEEDS CYCLES. MORE FOOD IS ON ITS WAY FROM PLACES LIKE SAMMY’S TRATTORIA TO SATISFY HUNGRY GUESTS WHO ARE JUST ENJOYING THE OPPORTUNITY TO DO SOME UNRUSHED SOCIALIZING. THANK OUR LUCKY STARS FOR CIAO BELLA WHO IS BACK TO HOOK US ALL UP WITH SOME OF THAT INCREDIBLE CROWD FAVORITE CHICKEN CACCIATORE HE MAKES THAT IS MAKING THE WHO DEALERSHIP WAFT THE FRAGRANT SENSORY DELIGHT OF HOME-COOKED ITALIAN FOOD. SWEET LELAS HAS ALSO GOT OUR GELATO FREEZER STOCKED–SO TOGETHER, THESE TWO ARE BEING NICKNAMED THE “TANTALIZING TONY’S” BY ALL THE GUESTS AND MODELS DINING IN OUR SHOWROOMS. RALLY FOR THE USO METRO. COME JOIN OUR STORM CELEBRATION… IT’S ALL TO BENEFIT THE USO AND TO SUPPORT OUR TROOPS. SEE YOU SOON! 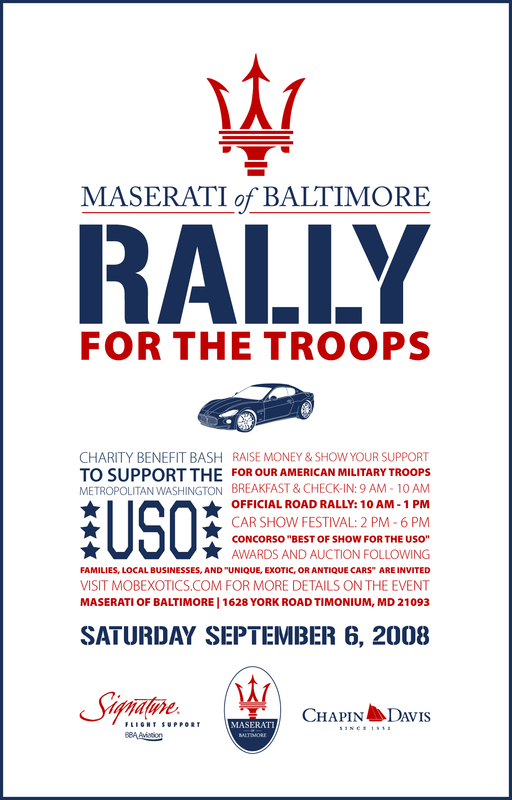 “Maserati of Baltimore Rally for the Troops” is a charity fund raising benefit helping to raise funds for the USO of Metropolitan Washington and demonstrating a public show of support for our active duty troops, military heroes, and veterans. Saturday September 6th, 2008, Maserati of Baltimore is hosting a full day of events with the help of key sponsors Signature Flight Support (the company who anchors all the private jet flights in and our of the BWI airport and partner terminals around the world) and Chapin Davis (a company providing investment management services throughout the Chesapeake Bay area and greater Baltimore Washington regions). Cars, food, music, competitions… what could possibly be more All-American than exotic car or old-fashioned automobile loving driving and tailgate parking enthusiasm? 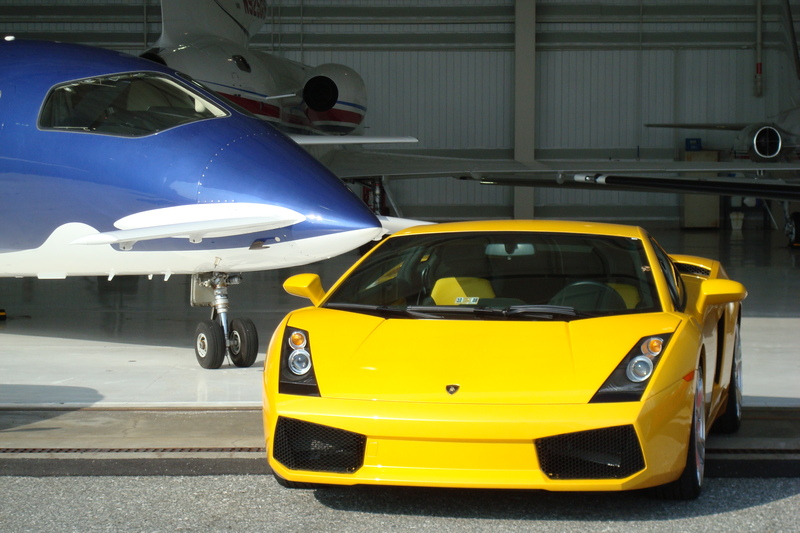 With many local Maryland, DC, and Virginia business sponsors participating, the festival is sure to be a welcome haven for all exotic car lovers seeking to help provide moral support to all our servicemen. In addition, all community spectators are welcome. There is no charge for spectator or guest admission to the grounds. Food and beverages will be available for sale throughout the day with a portion of the proceeds form all participating benefiting the USO Metro. If you are a soldier or military veteran, please contact us for complimentary VIP Passes by clicking HERE. “Cruise In” Short Term On-site Display For Named Owners and Internet Photo (non-competition): 2pm-6pm on site thirty minute to one hour parking with $25 minimum donation (or for longer periods in adjoining off site public lots as overflow tailgating lots with $10 minimum donations to the USO Metro). All “car show cruiser” donations will be provided with a coupon for 2 free beverages and 2 hot dogs from the Chapin Davis “American Grill”. “Best of Show for the USO”: 6pm-7pm live auction items and CROWD FAVORITE awards. The top ten cars evaluated by our team of car show judging professionals will be competing for spirit awards as crowd favorites. 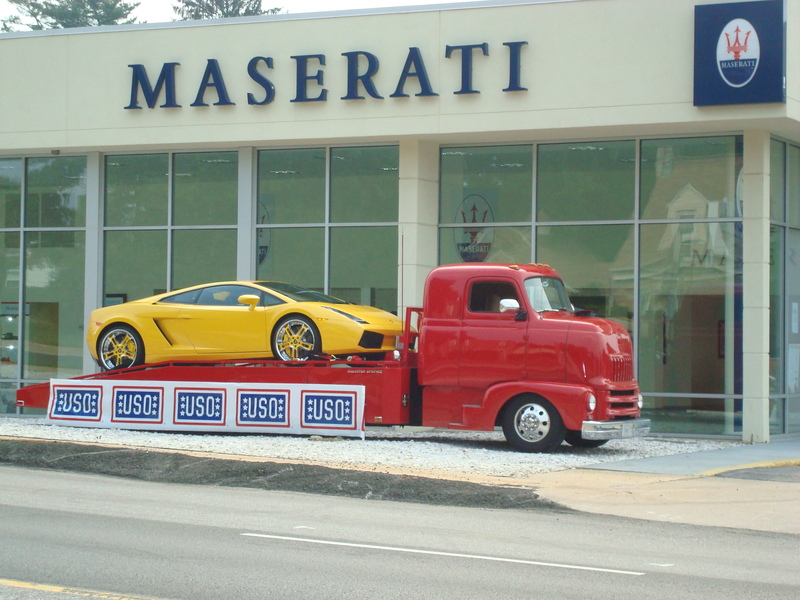 Maserati of Baltimore fully intends to promote not only the most glamorous or sensational cars on display, but to give the opportunity for owner and family spirit to come into play. Therefore, come one come all dressed or decked out in your most grad vision of a patriotism display. We want all of Baltimore county to see our guests and visitors coming and going in the most exotic red-white-and blue fashions that day. EDITORS NOTE: If you only have an hour to spend, the “Cruise In” option is absolutely the way to go… Show off your luxury automobile, antique classic vehicle, custom ride, or classic muscle car at the MASERATI OF BALTIMORE RALLY FOR THE TROOPS festival and have your car and show pic displayed online to support those troops serving far away from home. And, if the weather is too bad for you to arrive safely or you just can’t make it because of your hectic schedule that day or other travel plans that weekend, CLICK HERE to donate directly to the USO Metro.